Fiducial Lyman-break galaxy spectral energy distribution as a function of redshift. It is useful for many purposes to divide galaxies into different classes based on morphological or physical characteristics. The boundaries between these classes are often fuzzy, and part of the challenge of interpreting data is ensuring that the classes are defined sensibly so that selection effects do not produce artificial evolutionary trends. Increasingly realistic simulations can help to define the selection criteria to avoid such problems. Here we briefly discuss the detectability of several classes of galaxies of interest for LSST. Passively evolving galaxies. Early-type galaxies, with little or no star formation, represent roughly one-half of the present day stellar mass density (Bell et al. 2003). These galaxies formed their stars earlier and more rapidly than late-type galaxies. They are more strongly clustered. It is likely that mergers played an important role in their formation, contributing to their rapid star formation rates and their kinematically hot structure. It is also likely that some form of feedback or “strangulation” prevented the subsequent accretion and cooling of gas that would have led to further star formation. With good sensitivity in the i, z, and y bands, LSST will be sensitive to L* early-type galaxies out to redshifts z ~2 for the wide area survey, and, depending on observing strategy, to z 3 for the deep-drilling fields. High-redshift star forming galaxies. In the past decade or so, deep surveys from the ground and space have yielded a wealth of data on galaxies at redshifts z > 2. Photometric sample sizes have grown to > 104 galaxies at z ~3 and > 103 galaxies at z > 5. (Spectroscopic samples are roughly an order of magnitude smaller.) However, we still have only a rudimentary understanding of how star formation progresses in these galaxies, we do not know how important mergers are, we and have only very rough estimates of the relations between galaxy properties and halo mass. LSST will provide data for roughly 109 galaxies at z > 2, of which 107 will be at z > 4.5. Detection limits for LSST compared to a fiducial evolving L* Lyman break galaxy are shown in the above figure. Dwarf galaxies. LSST will be very useful for studies of low luminosity galaxies in the nearby Universe. Blind H I surveys and slitless emission-line-galaxy surveys have given us reasonable constraints on the luminosity function and spatial distribution of gas-rich, star forming galaxies. However, most of the dwarfs in the local group lack H I or emission lines. Such dE or dSph galaxies tend to have low surface brightnesses and are difficult to find in shallow surveys like the SDSS or 2MASS, and are also difficult targets for spectroscopy. Our census of the local Universe is highly incomplete for such galaxies. Mergers and interactions. The evolution of the galaxy merger rate with time is poorly constrained, with conflicting results in the literature. 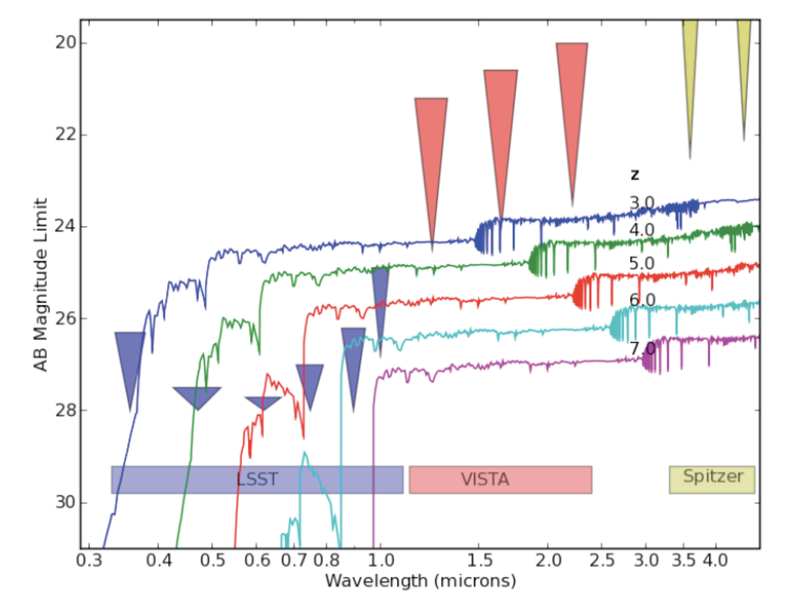 LSST will provide an enormous data set not only for counting mergers as a function of redshift, but also for quantifying such trends as changes in color with morphology or incidence of AGN versus merger parameters. LSST is comparable to the CFHTLS-Deep survey in depth, wavelength coverage, seeing, and plate scale — but covers an area 5000 X larger. Scaling from CFHTLS, we expect on the order of 15 million galaxies will have detectable signs of strong tidal interactions. At low redshift, LSST will be useful for detecting large-scale, low surface brightness streams, which are remnants of disrupted dwarf galaxies.